Have a wee look at this short film, shot in Donegal last week . 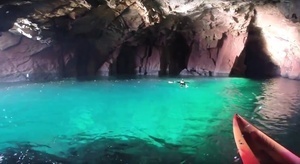 It was shot in a sea cave underneath Owey Island in western Donegal. The sun enters the cave at the correct angle to create a Blue Lagoon effect and the result is a surreal infinity pool which feels light you are swimming and suspended in light. Posted in Misc and tagged Cave of Light, donegal, Owey Island at 10:49 am on July 30, 2018 by Bodger. Did that in Capri…our guide ruined ‘the magic’ though by singing that cornetto song…true story!